Hiring an online digital marketing agency to help with your online presence is a big commitment. Once you hire a digital marketing agency, you give them a considerable amount of time to get results and fix your online. Plus all the access to a lot of personal company information and time commitment from your end as the restorer. If things don’t go as planned, you as the restoration contractor can be completely turned oﬀ working with any digital marketing agency. Which can hurt you in the long run if you decide to neglect your online presence because of a poor experience with a previous agency. On the flip side, when you work with a really good digital marketing agency who understands the restoration industry, you quickly see the benefits, the return on investment and a big boost for your sales. 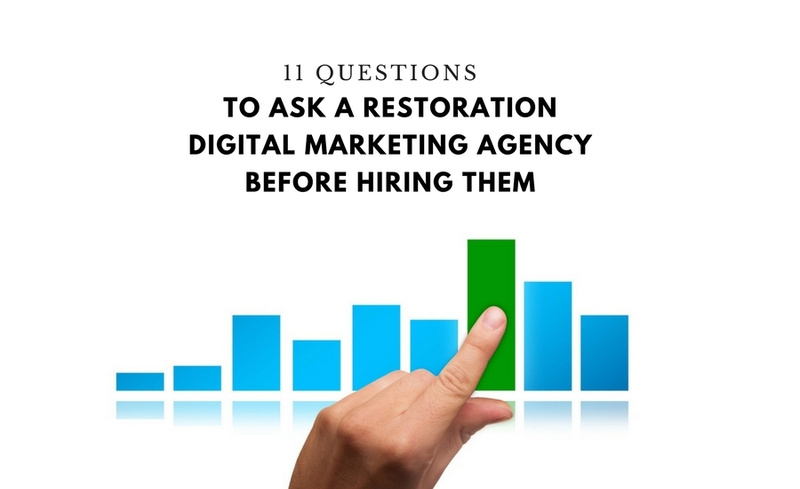 To help make the decision of hiring a digital marketing agency easier, we have 11 simple questions to ask before hiring an agency to fix your online presence and generate restoration leads.